The final basic production model of the M4 series medium tanks to come from the Detroit Tank Arsenal used a new composite hull with a cast glacis with the complete “big hatch” section for the driver and the bow gunner and initially the low bustle turret without and later with a loader’s hatch. 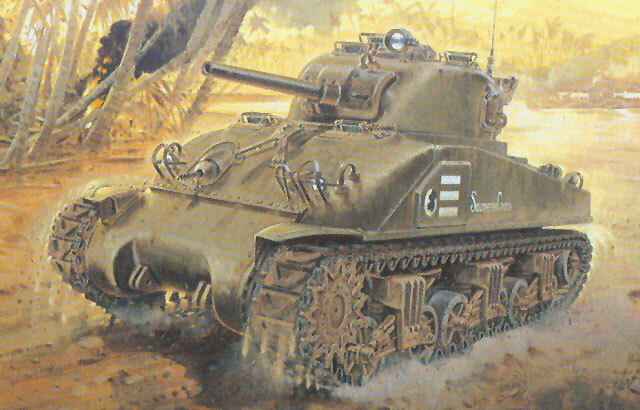 Nearly all of these tanks were sent to serve with the US Army in the Pacific, hence the PTO moniker (e.g. Pacific Theater of Operations) for this kit. A number of years ago DML released an Imperial series kit of the “Composite” hull M4 which could be built as either a US Army M4 in the Pacific or a Sherman IC Firefly; the kit included two turrets but suffered from the original Italeri suspension clone and also the much-disliked three-piece DML VVSS tracks. This kit is a total do-over and shares nothing but its subject with the original kit, but does use most of the “common” sprues from recent DML M4 Smart Kit releases. The kit has a ton of options, but many are not usable with the “Composite” tank. Photographic evidence tends to support the fact that these tanks nearly universally used the low-bustle turret with loader’s hatch and twin radio antennas (transmit/receive and receive only), M34A1 full width mantlet, “sharpnose” transmission housing, either five-spoke welded wheels or the “six spoke” welded solid wheels, flat or “upswept” return roller mounts, plate or machined drivers, T48, T49 or T51 tracks, no fenders or skirts, and no antiaircraft machine gun. While the kit comes with a high bustle shell and details, none of the photos I found show a Composite hull with that turret in the Pacific through early 1945. The kit provides brand-new moldings of the low-bustle turret and also a new “Composite” hull with the sharpnosed transmission. It comes with its own unique driver mounts; while recent complaints on the internet indicate some DML kits have these undersized, I cannot tell if these are or not as I have no blueprints for comparison. In any account, once the kit is built they are virtually invisible so this is more a matter of taste than wrong or in the wrong place. This kit provides a choice of fender tips (plastic or brass) as well as the M4A1 DV kit details for the rear and etched brass grillework under the air intake cover and also under the rear lip of the hull above the exhaust outlets. Some things are constants now such as the familiar M4A2/A3 basic detail sprue of tools and fittings as well. Four different finishing options are provided in the kit and Cartograf decals for each one: “Southern Cross”, 44th Tank Battalion, Limon, the Philippines, 1944; “Bushmaster”, 763rd Tank Battalion, 96th Infantry Division, Leyte 1944; “Battlin Basic”, 44th Tank Battalion, Manila 1945; “Ole Miss”, 44th Tank Battalion, Manila 1945. This fills another gap and leaves us with essentially only the M4A6 and the Sherman “cousins” Ram and Grizzly not kitted. It will be popular with Sherman fans as well as provide “mix and match” with other kits.